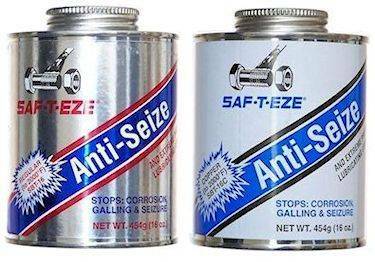 SAF-T-EZE® Regular Grade Anti-Seize is a smooth non-separating formula consisting of lithium soap thickened grease into which is compounded very fine flaked copper, as well as graphite lubricants and corrosion fighting inhibitors. The high performance grease and solid additives provide extreme pressure lubricating properties that prevent galling and cold welding and at the same time prevents water wash out and galvanic pitting from electrolysis of road salt, acid rain, or salt water. The properties of SAF-T-EZE® Pure Copper Grade Anti-Seize are similar to the Regular Anti-Seize but without the aluminum present. The copper color is apparent. Regular Grade Anti-Seize can be used as a lubricant, a sealer, a break in lubricant, a tapping compound on plastics as well as metals. Surface need not be cleaned before application unless grit or low quality oil/grease is present and ultimate performance is required. The reduction in assembly friction increases torque tension by about 20%. 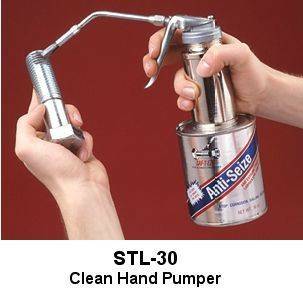 Use on threaded parts, bushings, gears, valve stems, chain sprockets, levers, hinges, pivots, rollers, heat exchanger or manifold bolts, or as a gasket release agent, etc. Pure Copper Grade Anti-Seize can be used as a lubricant, a sealer, a break in lubricant, a tapping compound on plastics as well as metals. Surface need not be cleaned before application unless grit or low quality oil/grease is present and ultimate performance is required. The reduction in assembly friction increases torque tension by about 20%. Use on threaded parts, bushings, gears, valve stems, chain sprockets, levers, hinges, pivots, rollers, heat exchanger or manifold bolts, or as a gasket release agent, etc.